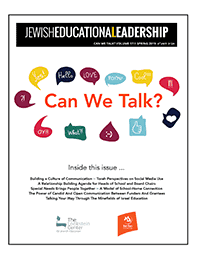 In July 2004, the particular theme of the Lookstein Center Principals Program summer seminar was The Leadership Challenge: Navigating the Two Worlds of the Jewish Day School. The keynote speaker was Rabbi Dr. Yitzchak Greenberg, one of the seminal Jewish thinkers of our day. Rabbi Greenberg’s presentation offered a brilliant and deep analysis of Judaism’s two-hundred plus year grapple with the variety of challenges presented by the modern world. The inspiring lecture, available here in print, set the tone for the entire seminar.